There was an argument in progress in front of the Gifted Homeschoolers Forum October Blog Hop sign. The usually lovey-dovey Twitter Bird couple, Tweet and Retweet, were debating about who should go on the blog hop and neither of them were prepared to acknowledge their own giftedness. It is so often the way! People seem happy to acknowledge their children’s giftedness and to advocate for their needs to be met; while not recognizing, acknowledging or affirming their own giftedness and needs. In fact a strange thing happened at the meeting I had to discuss Dr Ed Needs’ recommendations with Sprite’s teacher. And I had been mentally rehearsing the conversation. And I would mentally try out different possible replies. I felt that I needed to affirm my own giftedness as my work is based in helping people to recognize and affirm giftedness and seek the provisions, supports and resources they need for their children and themselves. But what if affirming my giftedness just confirmed to her that I was the crazy, over sensitive, perfectionist cheetah mama lady with no obvious giftedness and no formal qualifications who just thought the sun shone out of her precious child? 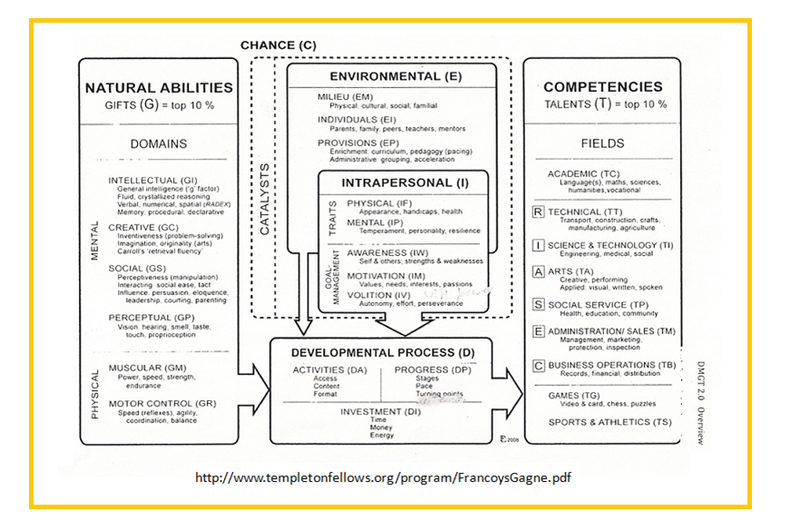 All I do would be able to do would be to show her Gagne’s DMGT innate giftedness to fully developed talents road diagram. I could tell her that, because of a combination of circumstances and some bad choices, I had not completed my journey across the path; although I was and still am gifted and that I just wanted the most suitable opportunities to be available for others. I would show her again the Columbus Group definition of giftedness and talk to her about the myths surrounding giftedness and Columbus Cheetah’s myth busting efforts and I would give her the One Page to Tell information sheet emphasizing the particular needs of the gifted and the possible causes of underachievement. But, as I said, a strange thing happened at the meeting. “I have been doing some PD on gifted and 2E students and I have been reading a lot. I have seen teachers leave the room in tears at gifted conferences when they realised that the speaker was describing not only their students but also the teachers themselves. “I realize now,” she continued, “that I was a gifted child and I never had any special provisions made for me. I know more now about the modifications needed for teaching gifted and 2E students. 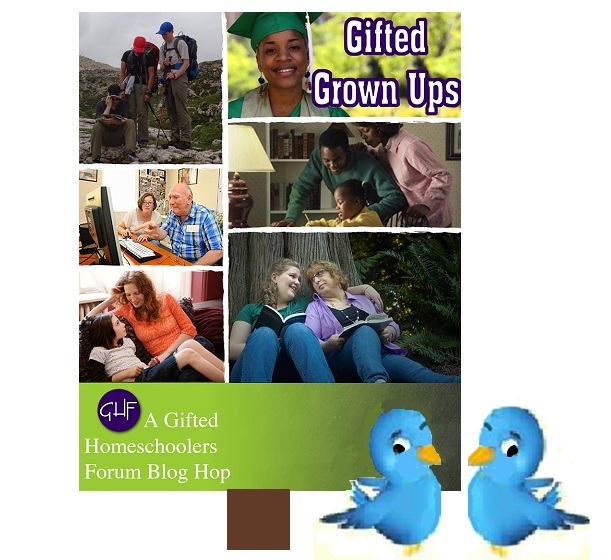 This is a post for the Gifted Homeschoolers Forum October Blog Hop: Gifted Grown Ups. This entry was posted in Uncategorized and tagged advocacy, blogs, gifted adults, Gifted Homeschoolers Forum, giftedness by jofreitag. Bookmark the permalink. Oh my – it is so often the way that we as adults are so reluctant to acknowledge that our kids might be *gasp* just like us. 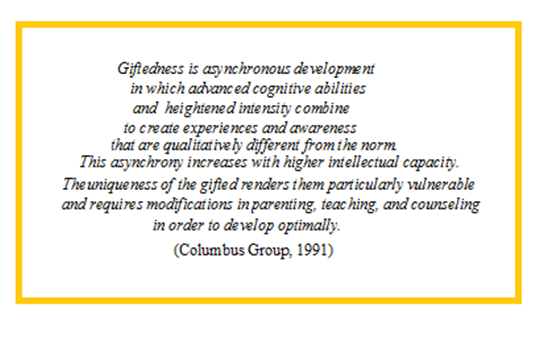 Thankyou Sprite for such a lovely collection of great ways to rethink what giftedness means. What a great post. I know my mom was always pointing to my dad as “the smart one”. Nonsense – they are both gifted. And I love that you are advocating for your daughter. I love the image of the parents pointing fingers at each other! So true! This post is part of the Gifted Homeschoolers Forum Blog Hop on Gifted Grown Ups. Great post!